I stumbled across Reecey Boi, a charismatic producer from the Land Down Under whose March track “Tic Tac Toe” shouldn’t be missed, while travelling farther down the Melbourne House rabbit hole. Along with some fellow cohorts (Lefty, YROR?, and Will Sparks to name a few), this troop of bouncy electronic producers has rapidly become a staple in my everyday listening. 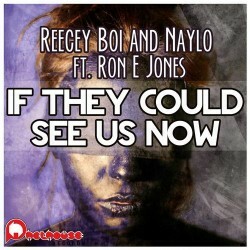 Though the original off his most recent release with Naylo, “If They Could see Us Now”, may not tap into the characteristic Melbourne sound, the remixes that join it make it well worth a listen. From the EP, two of the alternate renditions really stood out: those of Joel Fletcher and Bass Kleph. If I were to put bets on upcoming artists, I’d say Fletcher soon will be a recognized name. April saw him collaborate with rising star Uberjak’d and the now notable Deorro, while June will bring his bumpin’ electro house tune “Throw Ya Hands Up” to the venerable Ministry of Sound label. His remix delivers on the promise of Melbourne style, dropping syncopated beats and a telltale mid, though contrasts this with a solidly progressive break. Sydney native, now LA resident, Bass Kleph also lent his remixing skills to the track, having already received support from Tommy Trash at Coachella Music Festival. There’s a touch of tech house in Kleph’s version, as the drop strips away much of the noise and leaves the song minimalistic and bass-heavy. Keep up with him through his Klephtomania show, and, for those producers out there, take a look at his introduction to MASCHINE course online. Oh mah gad that joe fletcher mix. Yeah, pretty stellar. You should check out more of his stuff (Gash King Remix) and the other artists, too, if you haven't already.